Robbie Fowler is excited about the influence Steven Gerrard will have at Liverpool’s Academy, with his mere presence likely to make a huge impact on the Reds youngsters. 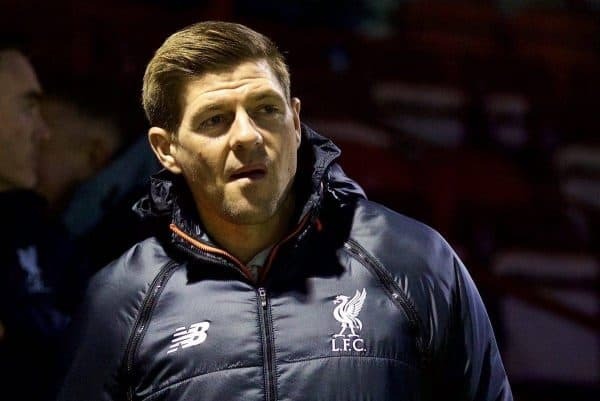 Having worked as a youth coach at Kirkby since his playing career came to a close, Gerrard is now all set to take charge of Liverpool’s under-18s ahead of next season. The 37-year-old has made a big impression since returning to Liverpool, with Jurgen Klopp full of praise for the work he has done. Former Reds striker Fowler is the latest to speak highly of his old team-mate, saying the youngsters will be in awe of Gerrard, and will only learn from him. “I think it’ll be brilliant,” Fowler told the Liverpool Echo. “When you’re a young kid walking around the training ground, and you bump into someone of Steven’s calibre, it’s massive. “Not just because the way he is on the pitch, either. The stuff that the kids can learn off him will be frightening. “Steven has always been demanding as a player, and I am sure he’ll be the same as a coach too, wanting the very best from everyone. “I think just walking around the training ground, just being there, it’ll impress the kids, have a big impact on them and drive them on. In fairness, Fowler is absolutely right, with Gerrard’s aura at the club something that almost cannot be put into words. What Gerrard achieved on the football pitch ensured he is widely regarded as Liverpool’s greatest ever player, along with Kenny Dalglish, and he has carried himself with real class since retiring. If he can continue to take his knowledge of the game into a coaching environment, we may see Gerrard mature into a manager of real quality one day—and the club’s youth prospects will benefit in the mean time.